After graduating from Shanghai JiaoTong University with an MBA, David Zhang worked with TOYOTA in Japan and education department of China State Council in Beijing respectively. David led Go Abroad China from a home stay focused company to a big professional and comprehensive culture exchange organization. David is dedicated to charity business as well and helped establish and manage several reputable charity organizations in Beijing and Tibet. Sarah is from Canada. She is at heart, an international citizen fulfilling a desire to learn more about China, to foster greater cross-cultural understanding. A graduate of Management and Marketing from the Economy Academy “D.A. Cenov” in Bulgaria and marketing qualification from Aston University, Birmingham, she worked in the marketing department of leading English companies in different fields, developed her skill in reputable European investment institutions and consultancy firms, before joining the Go Abroad China team. After years of work in several reputable software companies, like Octopace and Omnisys as engineer and CTO in Israel, Shlomo moved to China to study Chinese in Dalian University. Shlomo joined Go Abroad China in 2011 as business development advisor. Shlomo likes art and meditation. He is leading the team to make GAC a more reputable brand in east and west culture exchange field. Milen has an MBA degree from Cardiff University, U K where she was the recipient of the RMG - Marketing Research Award for excellence in Research. She has worked extensively in the field of research in UK working for corporations, which include companies from Publishing, Media, Marketing and FMCG sectors. 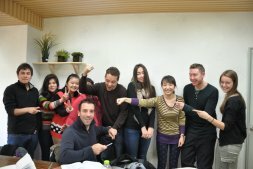 Now Katya works with Go Abroad China to further promote GAC worldwide. Jessica graduated from Grenoble Management School with a Bachelor degree in Marketing and Audit. While at university, she gained work experience interning in marketing positions in such companies as Price water house Coopers and General Mills. 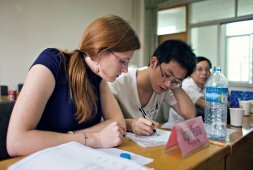 Following graduation, she undertook Mandarin Chinese program at Peking University. Jessica helped GAC establish a sound customer service system, which guaranteed Go Abroad China clients enjoy reliable service and happy lift in China. Nadia graduated from Beijing Normal University, specializing in Teaching Chinese as a Second Language. 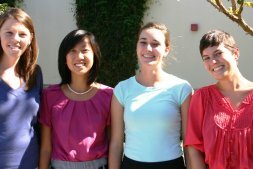 After working in English First as administration manager, Nadia transferred to GAC. Now she is working with Go Abroad China logistics for program participants in Beijing and Shanghai. With over 5 years of experience in catering field for foreigners, Nadia will try to provide professional arrangement and service to GAC program participants. After working in foreigners’ visa service center for years, Jane joined the team of Go Abroad China and continued foreigners’ service work. She is always very patient when GAC program participants first come to China and ask her many questions. She is always eager to help GAC clients who need help. Dong graduated from Beijing Language and Culture University with a Master degree in TESOL and Bachelor degree in Chinese Language and Literature, and has been teaching Mandarin for over 5 years. Lena studied Asian culture in Oxford University and Chinese language in Peking University. As a foreigner in Beijing, Lena has rich experience in culture difference between western countries and China. She is very dedicated girl, and always provides through care and service to Go Abroad China program participants. and sounds of China with GoabroadChina.